This week I said good bye to my apprentices Lynsi Pasutti and Kate Westlund. I had no idea how much of a doorway it would be. I’ve been in many airport terminals, have walked out of many houses, and have felt the physical and emotional tug that comes from crossing into another dimension. Each time I need decompression to properly assimilate into my new landscape. The girls have left me, but I feel as though I am the one beginning a trip. There’s no destination, but I am on a precipice surrounded by everything I have worked over twelve years to put into place on this farm. With Lynsi and Kate’s help it was possible to uncover the dust on many wonderful parts of my life at Smithfield. I have my son Linus, a modest business large enough to support me and Linus while I pursue my art, a staff that allows me to spend time in the studio, a gallery, and a comfortable home that I share with my fractured family. In all ways I am poised to take a leap into an amazing life. I have never been so terrified. Yesterday I went to Border’s in search of books for a correspondence course I just started with an artist, Mary Ann Wakeley. I ordered most of what I wanted on Amazon, but I couldn’t wait til Super Saver Shipping would have them at my door on November 1st. In the paltry aisle of art books with only the most predictable on the shelf, a stranger said hello. We exchanged names and a handshake. He commiserated on the lack of anything interesting and mused over the former erotica section. Since I can be shy, “Exit Stage Left” immediately came to mind, but I listened for a few more minutes. 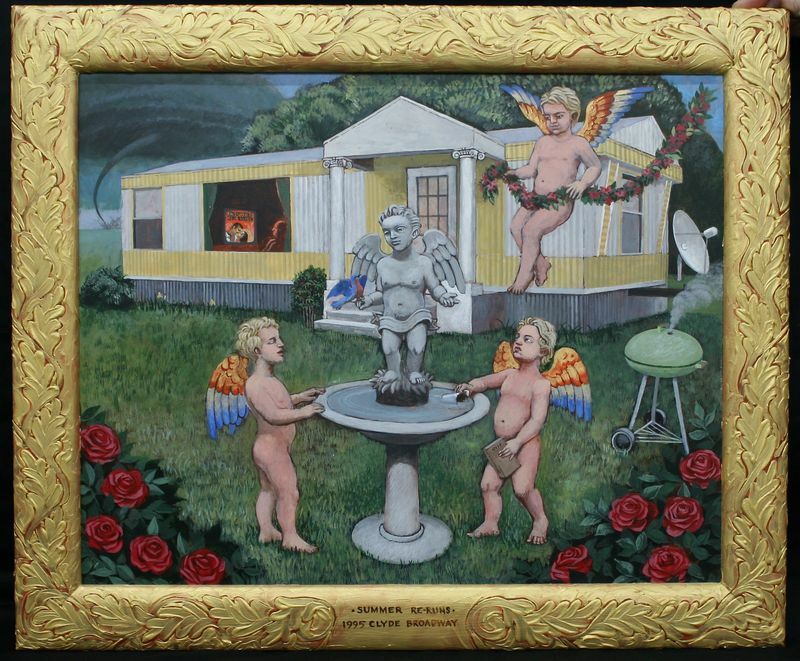 Clyde told me his agent was pushing his new work down in Atlanta where he had entered some work recently for the Elizabeth and Mallory Factor Prize for Southern Art. Overwhelmed by so many details shared in the span of a few minutes, my need to go look for my son in the children’s section afforded me an opportunity to walk away. Clyde found me later and recommended the magazine section which was more au courant. He was right, however, nothing offered seemed appropriate. With no Wassily Kandinsky: Concerning the Spiritual in Art or anything else on my list to be found, I settled for a book called New Acrylics Essential Sourcebook. Today on facebook was a message from Clyde. 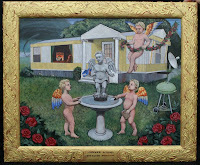 He encouraged me to keep painting and sent some links to his work. Ain’t the internet great? I only remember saying my first name and that I painted. Curious to know about Clyde’s work, of course I took a peak. 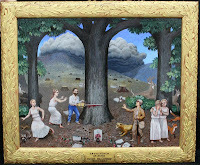 It is very reminiscent of Henri Rousseau with a modern Southern Gothic twist. I particularly liked the work Summer Reruns. 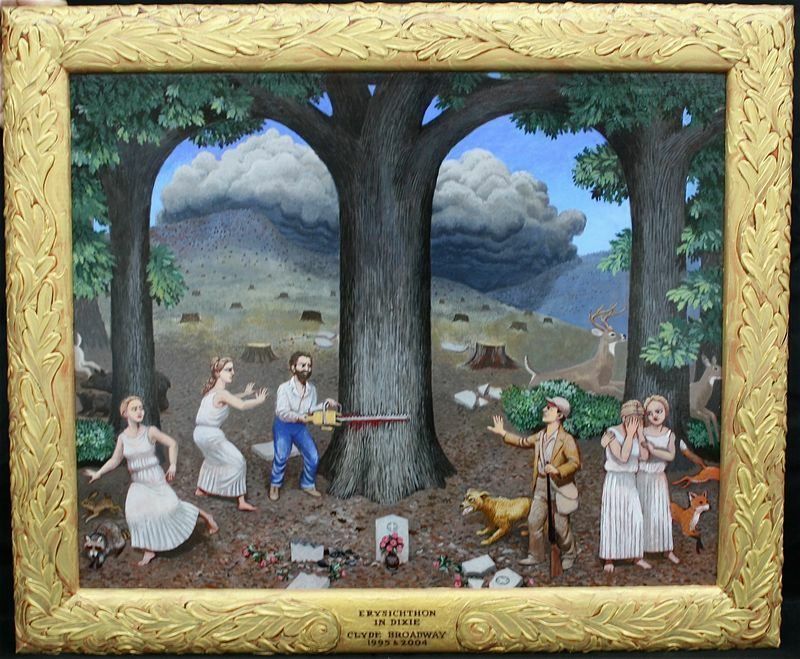 The Factor Prize site has an interesting array of artists, including its 2010 recipient Radcliffe Bailey. His work on the African American Diaspora certainly merits accolades and contributes to a new understanding of the South. His use of “culturally charged” objects and photographs creates harmony in an array of masterful sculptures, paintings, installations, works-on-paper, glass works and modified found objects. His installation piece Returnal struck the strongest chord. As always, prize winning work with cultural heft leaves me feeling small in the world of art. More importantly, however, stumbling onto Bailey’s work made me wonder how I could orchestrate harmony in my own body of work. 2009 was a productive year of painting, photo montage, poetry, one clay work and lots of sketching. 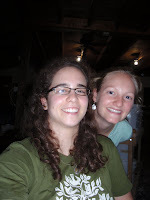 2010 has been somewhat less productive, but that will change with coursework in Mary Ann’s class and a renewed appreciation for my place on the farm. This most recent work was done with stolen time after a bunch of Autumn mornings that begged to be painted. Pastels are not my medium of choice, but they help me spit things out when under duress. The sky has set the scene for many of my photographic works in the last two years. Most often it has been the vehicle for muting drawings too raw to share. In Autumn the earth meets the sky in spectacular light and color sending me into fits for not training as a plein air painter. 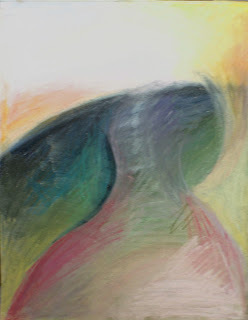 Abstraction has never worked for me, or at least no one close to me has ever said, “Wow! I love it when you do this.” Nonetheless, I am training with an abstract artist to see if I might achieve a harmony unattainable so far in my checkered career. Many questions nag at me in spite of my joy over this new plan. What about my bunnies? Who’s going to want my work? What if I hit another wall? Do I deserve to sit around and make art on a busy farm? Shouldn’t I be making more money with noodles instead of pastiche? I could go on. I’d rather get started and see where it takes me. So I proffer this blog as the first entry in my Artist Journal to be kept on a journey put off for far too long. 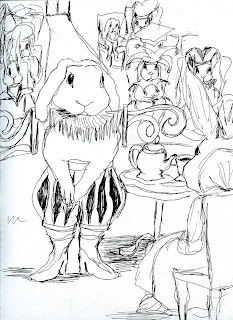 In homage to the Bunny who started my string of solid work in 2009, here is an early bunny piece made sometime between 2000 and 2005 (I think). I rarely felt my work was worth signing or documenting before 2009. The queen is holding court with a jester (perhaps) presenting his case? It was a flash of something forgotten that made this one bubble to the surface. I should thank that stranger Clyde for saying, “Keep on Painting.” It still amazes me how easy it is to find a person on line with very little information. One Response to "What’s Next at La Capretta"
It’s all good here, Nancy. You had a busy week. I am very excited about working with you. Most if not all of the books I ordered came from Amazon. I also added a few more to the “library” recently and will continue to do so. You may find some more insightful then others. It is nice to get to Borders now and then to encounter actual humans though, LOL. Loved your Clyde story and accompanying work! 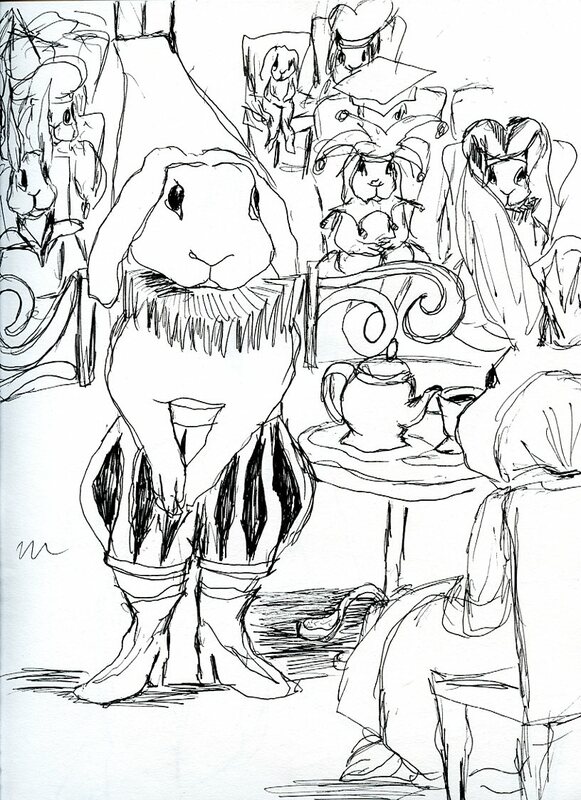 Your images are terrific, especially the bunny (I adore her boots !!) Keep up the excellent blogging.